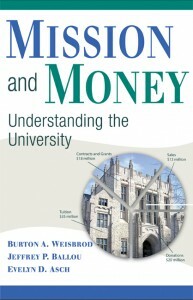 Burton Weisbrod, one of the authors of Mission and Money did a very interesting Q & A with Inside Higher Ed today. Questions of university funding are now swept up in our economic mess, and for now, no one’s asking if endowments are too big. Weisbrod’s answers poke a little further into how universities really get their money, and why even rising tuitions just won’t cut it. Q: What most surprises you about the economics of financing colleges? What would most surprise the public about the revenue on which colleges and universities depend? A: None of our findings about college finance really came as a surprise. Study of public and nonprofit organizations in many industries including not only colleges but also hospitals, nursing homes, museums, day care centers, medical research organizations, food pantries, and so on have shown that all are continually searching for revenue wherever they can find it. The missions of not-for-profit organizations encompass providing services that may well be socially desirable but that are privately unprofitable — such as serving the poor, supporting basic, not patentable, research, and preserving society’s cultural values through, for example, music and art. Because these activities are typically unprofitable, colleges have no choice but to find offsetting sources of profitable activity or close their doors, which some end up doing.